I’ve been a huge fan of Barry Lyga’s ever since reading his wonderful Jasper Dent novels. Stories about a teen whose dad is one of the planet’s most notorious serial killers and who uses his knowledge to solve crimes involving other serial killers? Super awesome. But we aren’t here to hear me fangirl about I Hunt Killersand its many other novels. We’re here for a review on After the Red Rain. I should say right now that I had some incredibly high expectations for After the Red Rain. After all, the last Barry Lyga novel I read ended on a huge note with some major plot twists. 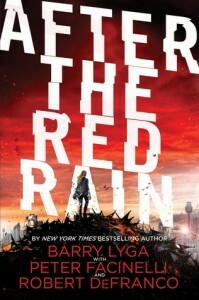 Co-written alongside Peter Facinelli and Robert DeFranco, After the Red Rain is a novel set in a dystopian future where one teenage girl lives on a ruined Earth. In a super city that is overpopulated and with constant warnings about air pollution, Deedra has been working incredibly hard for the Magistrate in order to support herself. Leaving to scavenge the outskirts of the city, Deedra encounters Rose. He’s a beautiful boy. One who is mysterious and vanishes just as quickly as he appeared. Thinking she’ll never see him again, Deedra is surprised when their paths cross soon after in the wake of a potential tragedy. When the two finally begin to establish a connection with one another, the Magistrate’s son is found murdered and the only possible suspect is Rose. With the mystery behind the murder beginning to unravel, Deedra and Rose begin to also unravel hidden truths about their world that will leave it forever changed. After the Red Rain opened in a way that completely blew my mind. It begins with the introduction of a machine that grinds up the bodies of dead people. Kind of gross and gory to imagine—but it was an intriguing premise. Especially when the man who tends to the machine finds a live baby meant to be grinded up as well. What does he do? He saves the infant who later grows up to be our protagonist, Deedra. Is it awesome? Oh yeah. But what surprised me most aboutAfter the Red Rain was that there were no scenes afterward that were nearly as interesting or engaging. The majority of After the Red Rain was spent introducing a huge amount of plot without taking the time to really explain anything or interest the reader. There’s so many plots and side plots that are revealed and yet, it felt like there was justso much storyline for so many pages in the novel. Personally, I felt that while reading the experience was immensely repetitive as well as clunky. There were moments where I would have to put down the novel because it felt like the narrative was just going in circles over and over and over again. And by the time something interesting and life-altering did occur in the novel, it got watered down with various other elements that are crucial to the plot. I don’t want to give too much away because spoilers are the worst, but there is a major supernatural/sci-fi element to a particular character in the main cast. This element is never explained in a way that can give the reader complete and total assurance as to what their situation is. 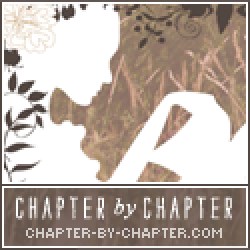 All in all, it’s another piece of the plot that leaves the reader with a sense of confusion. There was a lot of After the Red Rain that held so much potential. The romantic sub plot. The badass dismemberment of the governing system. There was so much potential for it to be a story that was filled with lights and fireworks… but in the end, After the Red Rain fell very flat and did not live up to expectations. It’s a novel that needed more time to completely map out its plot and was (for the most part) underwhelming. I would recommend After the Red Rain to readers who are looking for a novel taking place in a dystopian society and to any readers who are looking for a novel with a very odd supernatural element. But just because it wasn’t my cup of tea doesn’t mean that it lacks the potential to be yours.